Randy has a regular Specialized Stumpjumper mountain bike with the heavy-duty Old Man Mountain racks and Ortlieb "Classic Roller" panniers. Total weight of the stuff in the bags: between 40 and 60 pounds, depending on how much food and water we're carrying. For the Dempster Highway section we're planning to carry about seven days' worth of dehydrated food to get to Eagle Plains (which we estimate to be 5 days) and then we'll pick up another 7 days' food from the Eagle Plains Hotel - we'll ship it there in advance. Normally we don't use dehydrated food, because it's expensive, hard to get in most places, and probably not as good for you as real food. However, since the Dempster is 450 miles long with no services, and since it's at the beginning of our trip, we decided to go with the dehydrated stuff from Mountain House which we actually like quite a lot. 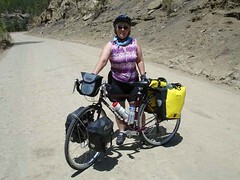 (This is Nancy's bike that she used from Inuvik to Denver. At that point she switched to a Stumpjumper mountain bike. See the current gear article. Here's Nancy's beautiful redone bike. She spent an enormous amount of time and money retooling it since our New England Trip. This is a custom Serotta Rapid Tour. She has fairly standard racks and has Ortlieb Classic Roller panniers on the back, and waterproof Nashbar panniers on the front. The handlebar bag is new - it's from Ortlieb. Reality sets in! June 1! We are preparing for departure! 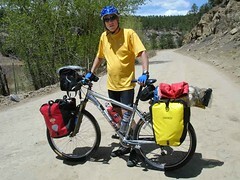 Leaving Denver June 1, starting the flight north on June 2, and starting the ride south from Inuvik on June 9! My brother Collin and his wife Marisa of Parkwest Air are going to fly us up there in their Cessna! And they're leading a group of 10-12 more planes. We start from Grand Junction, Colorado on June 3. Below this posting is a map of the first part of our route and here is the same map as a pdf and as a large jpeg - click to see all sizes (with all the detail). Well, we're getting ready for the big trip now, and have plenty of work to do. I'll post some of the research here so you can follow along or add in information as you see fit. If any of you have experience with the far north or other parts of the trip, we'd sure love to hear about it! About June 3, my brother Collin and his wife Marisa are going to fly us up to Inuvik in his small plane. 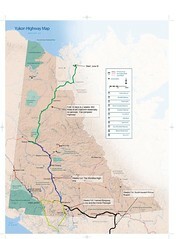 We will have shipped our bikes in advance, and we hope to get to Inuvik about June 9. Within a day or so, we expect to be headed south on the Dempster highway! Our expectation is that we'll ride south to Denver, probably going the US West Coast route and then coming across the desert, arriving in Denver around November 1. Well, we're home and settling in to an altered reality. The cat is really lonely and there are lots of things to catch up on. Miles: We went 691 miles on our big loop, didn't do the loop we planned since we went up into Canada and came back on the Northeast side of Vermont. Our biggest day was a 65-miler, and the shortest a 23-mile day. The average day was about 43 miles. 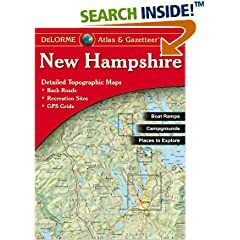 Our friend Roland gave us the Delorme atlases/gazeteers for New Hampshire and Maine, and they made all the difference in our trip. (We later bought the Vermont gazeteer.) We were able to get *good* information about little back roads, and always had options if we didn't like the highways we were on. As bad as it sounds, I just ripped the appropriate pages out of the books and put them in my map case on my handlebar bag and we followed them along. They're wonderful and highly recommended. I've used them a bit in the past, but will probably always carry them in the future. We made it to Manchester safely, packed up our bikes at the bike store, shipped them off FedEx Ground (hope they get home OK) and then mailed ourselves home today. Made it just fine - My son Mark picked us up at the airport. Now that we have easy internet access we'll post more articles and pictures in the next day or so. They just never stop spoiling us. As we rode south in Quebec on a gloomy, rainy afternoon, we decided it was time to find a place to camp, and saw a sign pointing to a campground on Lake Memphremagog. 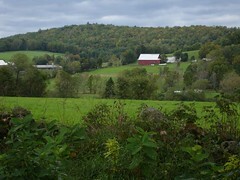 So we rode in toward it, but like most campgrounds this time of year, it was abandoned. There were some campers remaining there, but no people. So we rode around looking for a good spot. But there was somebody there! A late-season fisherman, Pierre, a French-Canadian with nearly no English. But he could say "Hongree?" and offer us the world's best minnestrone. (Turns out he's a chef at a nearby ski area). And he could say "Sleep here?" and point into his spare camper, all set up. And he fed us in the morning his wonderful French toast with Quebec maple syrup. If you're ever depressed, go for a bike tour. We're about to forget how to camp.